134 The Lady Gorings Remedy for a Sharp Urine Boil running water with liquorish till it be something strong of it boil also in it a pippin or two when it is boiled put in some brown sugar candy. Drink of it every morning fasting a pretty draught. 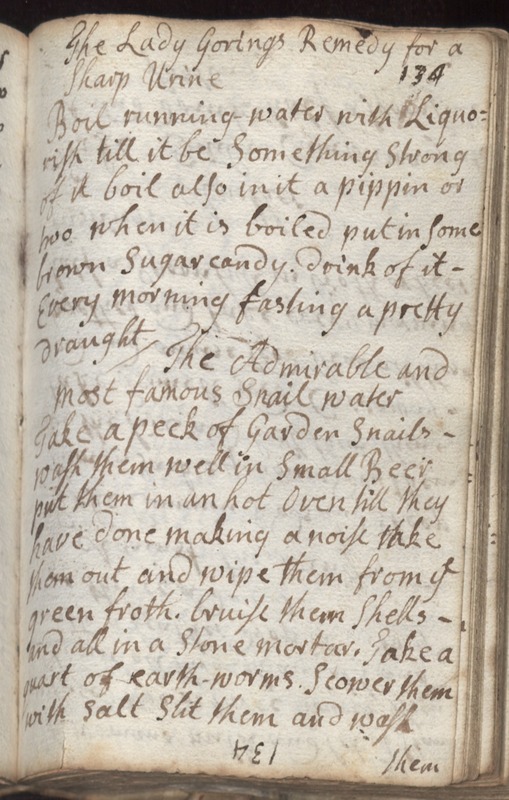 The Admirable and most famous snail water Take a peck of garden snails wash them well in small beer put them in an hot oven till they have done making a noise take them out and wipe them from ye green froth. Bruise them shells and all in a stone mortar. Take a quart of earth worms. Scower them with salt Slit them and wash them.